Chepauk Super Gillies is all set to take on Karaikudi Kaalai on Saturday, July 21, 2018. CHE have played two and lost two, on the other hand, KAR has played two, won one and one and one match was a tie. In Today’s Dream11 Fantasy Cricket Match of CHE vs KAR 10th T20, TNPL, we will cover Pitch Report of MA Chidambaram Stadium, Chennai, Probable Playing 11, Fantasy Cricket News, Toss Prediction and Who Will Win? You May Like to Read Latest Cricket News. Who Will Win the 10th T20 Match, Between CHE vs KAR and Toss Prediction? Where Can You Watch the Live Streaming of KAR vs CHE, 10th T20I or Channels to Watch? If we look at the previous matches, CHE has defeated KAR on two occasions. Both the teams are equally good. The batting department of CHE is a bit of concern. According to our astrology prediction, KAR will win today. The team winning the toss should opt to bat first as scoring runs in the first half will be easy and chasing a score may become a difficult task. According to our astrology prediction, CHE will win the toss and ask KAR to bat first. Date: The match will be played on the 21st of July 2018 (Saturday). 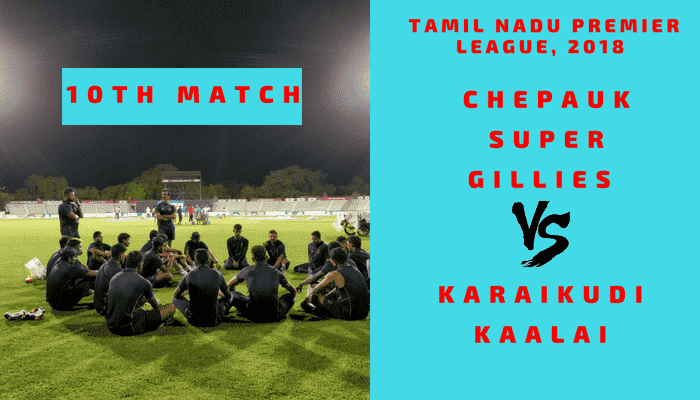 Match: Tamil Nadu Premier League, 2018, CSG vs KK, 10th Match. The Pitch of Chennai, MA Chidambaram Stadium has a track record of favouring the spinners. It will be easy to score runs in the first half as compared to the second half. The fast bowlers will also get some benefit from the pitch. In the morning it will be partly cloudy and rain is expected in the afternoon and in the evening. The match may be delayed due to rain. The cricket fans and fantasy users can get the complete game. It will be a hot day. The temperature is expected to be 35-Degree Celsius and the humidity to be 47% which may go up to 60%. Both the teams have played two matches against each other in last two seasons. The result may make you unhappy if you are a KAR fan. CHE has defeated KAR on both the occasions. In the last encounter, Chepauk Super Gillies has defeated Karaikudi Kaalai by 6 wickets with 6 balls remaining. Highest total on this ground is 167/5 in 20 overs by NZ vs IND. Lowest defended on this ground is 167/5 in 20 overs by NZ vs IND. Baskaran Rahul, S Karthik, Murugan Ashwin and Ganga Sridhar Raju are the key performers of CHE. Shaurya Sanandia and Kedar Devdhar will not play being outstation players. Vijay Shankar is also not available for this match. MK Sivakumar may be replaced by Arun Kumar. Gopinath (c), R Vishaal, Murugan Ashwin, MK Sivakumar/Arun Kumar, Ganga Sridhar Raju, Baskaran Rahul, Sunny Kumar Singh, Uthirasamy Sasidev, R Alexander, M Siddharth, S Karthik (wk). S Karthik (wk), A Aarif, MK Sivakumar, Baskaran Rahul, Gopinath (c), S Harish Kumar, Ganga Sridhar Raju, Manav Parakh, Samruddh Bhat, Uthirasamy Sasidev, M Siddharth, Murugan Ashwin, R Alexander, Sai Sudharsan, Sunny Kumar Singh, Arun Kumar, R Vishaal, B Arun. Srikkanth Anirudha, Maan Bafna, and V Aditya are the key performers of KAR. Dinesh Karthik is not available for this match. Unmukth Chand and Atit Sheth will not play being outstation players. They may go with the same Playing 11. Srikkanth Anirudha (c), V Aditya, R Rajkumar, Yo Mahesh, M Shajahan, Velidi Lakshman, S Swaminathan, Maan Bafna, R Kavin (wk), S Mohan Prasath, Rajhamany Srinivasan. Maan Bafna, Ashwath Mukumthan, V Aditya, P Murgesh, S Radhakrishnan, Srikkanth Anirudha(c), S Ganesh, Rajhamany Srinivasan, S Kishan Kumar, R Kavin(w), T Ajith Kumar, M Shajahan, Velidi Lakshman, Yo Mahesh, S Mohan Prasath, R Rajkumar, L Suryaprakash, S Swaminathan. Fantasy Cricket Expert Tips: Both the players are good. You can select any one. 87.76% of the users have selected S Karthik in their Dream11 Teams and 7.55% of the users have selected R Kavin in their Dream Teams. Make a combination of the above players for multiple teams. Conclusion: This is it for Today’s Dream11 Fantasy Cricket Match Prediction of CHE vs KAR, 10th T20I Match, which will be played on Saturday 21st July. We have covered all the details required to win any fantasy leagues. We have covered players recent and past performance, dream11 guru and crictom prediction, all the latest news and updates of Chepauk Super Gillies Team and Karaikudi Kaalai Team, weather report of Chennai, dream 11 best teams, keys players, the best choice for captain and vice-captain, where to watch the live match of CHE vs KAR, 10th T20 Match and the details of live streaming of Tamil Nadu Premier League (TNPL), 2018.
where is the team news? Thanks for your support. We try to predict as close as possible and you cricket is a game of uncertainty and no one can predict 100%. Although our prediction is backed by data and stats.